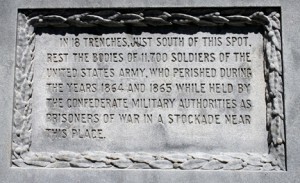 From December 1861 to February 1865 Confederate States of America operated a prison camp at Salisbury, North Carolina. As the prisoner exchange agreement between the Union and the Confederacy broke down more Union POW’s were sent to Salisbury. 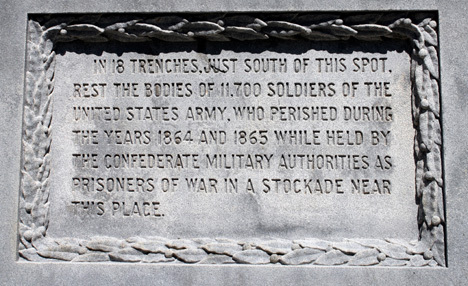 Many prisoners died during the fall and winter of 1864 – 1865. 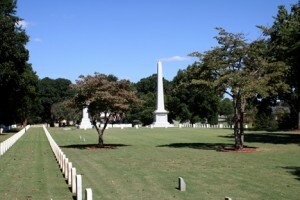 In 1868 the War Department published a list of 3,504 prisoners who died at Salisbury. The same year the War Department claimed that no records of deaths could be located but that 12,000 Union POW’s were buried in trenches at Salisbury. 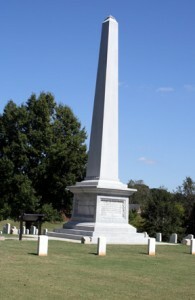 In 1873 Congress allocated $10,000 to erect this monument at Salisbury. The names of the soldiers who died at Salisbury were forgotten. Today the Department of Veterans Affairs (VA) perpetuates this lie by refusing properly mark the graves of the American Soldiers buried at Salisbury despite a Federal Law that requires the VA to mark the graves. Read more about the Salisbury Prison.